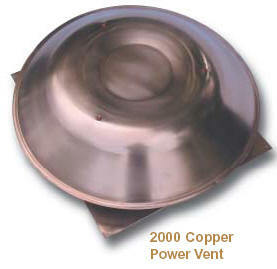 Volko copper attic fans... power attic fan in copper... ventilation solutions in copper. • Deep drawn flange and unique rain shield keep water out. • Factory-set adjustable thermostat (switches on at 100 degrees and off at 85 degrees). • Thermostat features a "push to test" button. • Balanced fan blades for quiet operation. • 8x8 aluminum screen attached for insect protection. • Humidistat available at an additional cost to allow the unit to discharge moisture-laden winter air automatically. • Settings for humidistat are: minimum 80%, normal 42%, and maximum 20%. • Humidistat is adjustable to fit individual attic humidity levels. • This is an exhaust louver.